So you may be asking yourself, what does ABV, IBU, and SRM mean? What is a beer style? Well, luckily you know some brewers who are about to drop some beer knowledge on you. ABV: This is the Alcohol By Volume; higher the % the more Alcohol By Volume, or stronger the brew. IBU: This stands for International Bitterness Units. The longer hops are boiled, the more bitter a beer is. There is a complex formula to calculate the number, but simply put, we add hops, and the IBUs go up! Just remember that IBUs may be perceived differently from beer to beer depending on how much residual sugar is left to balance out the bitterness. Hopidocious, brah. SRM: The Standard Reference Method is used to determine the color of the beer. The higher the number the darker the beer. Just because a beer is dark doesn't mean it's heavy, so be sure to give everything a try at least once. We've attached a SRM scale below to help you with your decision process. Really though, best strategy -> Don't think just drink. Beer Style: The Beer Judge Certification Program, BJCP, has created multiple beer styles. For each style there are strict guildlines for ABV, IBUs, SRM (which you're all experts at now after reading the above bullets), and ingredients used in the beer. We love how the different styles each have their own history and makes for easy work when comparing different beers. We also like to do things on our own way from time to time. Any style with an * next to it denotes, we didn't follow the guidelines this one's outside the box and does not conform to BJCP style. We believe that these beers are unique enough to warrant their own style and the only thing that matters is taste! So, BooYEA! We believe that there is a craft beer for everyone. We hope you find yours @ DBC!! Thank you for checking us out!! 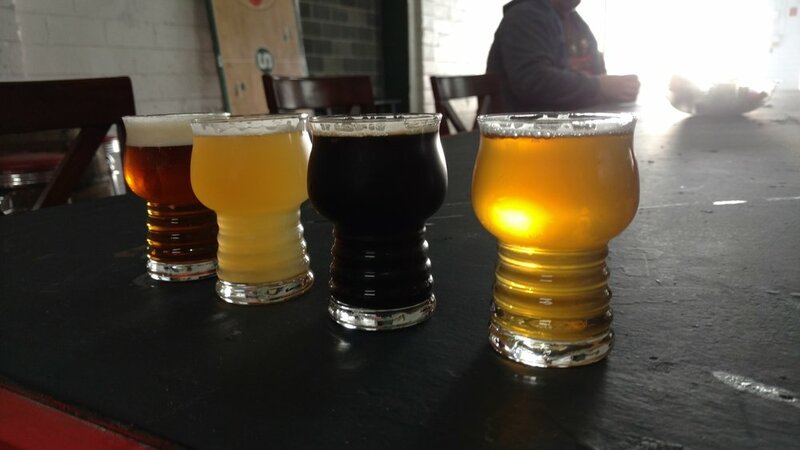 Located in Dearborn, MI, Downey Brewing Company is a rising super star in a growing craft beer market. The Great Beer State. How to Find Us: We are located in somewhat of a warehouse district of Dearborn's east side. The address is 13121 Prospect, Dearborn, MI 48126. Our building shares space with another Downey owned and operated business, KDG Finishers Corp. Dennis Downey (Father to Dean, Grandfather to Dan and John) owns the building which we are using to get this operation off the ground. LOOK FOR THE RED DOOR WITH THE DOWNEY BREWING COMPANY NAME!! Food: We do not serve food, but we are food friendly. Feel free to bring in food. There are numerous local eateries that deliver to our location. Additionally, from time to time, we will have a food truck on premises. Check out the "Events" schedule for days that a food truck will be here. Parking: Parking in front of our building is scarce (only 8 spots). However, we do have a lot located around the corner where Leonard Street street dead ends. Additionally, there is street parking on Prospect near Schafer and street parking on Jonathon and Leonard. Growlers and Beers to Go: We offer Growlers of all 8 beers on tap. Growlers are $5 in addition to the fill price. Fill prices vary based on the beer. Additionally, we also have a limited number of our beers in bottles that are available to take home. We suggest buying bottles over growlers if the beer is not going to be consumed within the week. Event Space: Interested in renting out the taproom for a private event? Give us a call and we can set something up. Our warehouse has so much room for activities! We offer tours of our brewery the 3rd Saturday of every month at 5:15PM. If the 5:15 Tour fills up, a second, 5:45 Tour will be offered. $15 gets you a flight of beer and a half hour tour of the facilities with our Brewmaster. Space is limited and the sign up sheet is in the taproom. Call us, email us, or walk in to sign up for the next brewery tour. 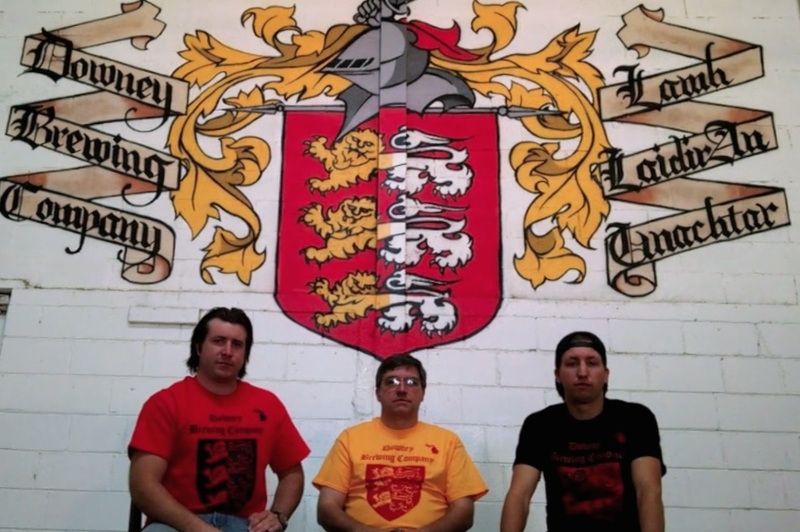 Downey Brewing Company was first conceptualized in the fall of 2013 and founded in 2014 by Dean Downey, Daniel Downey and John Downey. The idea stemmed from an ever-growing passion for brewing delicious beer and a unique opportunity of various skill sets and business synergy. The ethos of Downey Brewing Company have roots in the world of home brewing. Dean, with a background in chemistry, has been brewing beer since the early 90’s, and like many home brewer’s had aspirations of opening his own brewery one day. John started to brew beer while still a student at Michigan State and really jumped in feet first, taking a real interest in the process and art of brewing as well as the craft beer industry itself. With some practice, some self-education and a bit of talent delicious full flavored craft beers were produced and enjoyed by friends and family. Great beer being fundamental and necessary for a successful brewery it is far from a complete picture, or pitcher in this case. First and foremost a location is paramount, as operations need to move out from the home brew level to larger scale. As luck would have it, Irish being our heritage, a location of suitable size would present itself with an all in the family solution. Dennis Downey, father to Dean and grandfather to Daniel and John, just so happens to own a business and a building with some unused space. Being opportunistic John and Daniel would present the idea of Downey Brewing Company to Dennis and the request for the use of space would be granted at a price of $1 per year in rent. 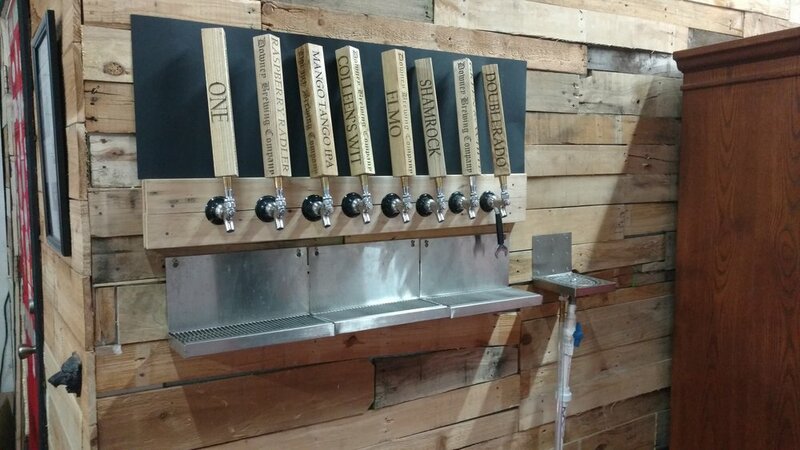 At this point Downey Brewing Company shifted from an idea to reality and the team would waste no time purchasing their first piece of equipment. As the story goes, within hours or perhaps a day at the most, an excited John Downey would pull the trigger and purchase the first two pieces of equipment – a mash ton and a hot liquor tank. There is a catch; it needs to be picked up from Minneapolis, Minnesota. Road Trip! In their previous life this mash ton and hot liquor tank functioned as dairy tank. Next, over the course of a few months an in-depth look into the growth of the craft beer market, specifically in Michigan, would be conducted as well as a high level cost analysis to produce and sell the tasty beverage. Packaging, storage, ingredients, overhead, marketing and other expenses would be considered. Architects would be consulted, meetings with city planners held, legal and zoning restrictions clarified. Downey Brewing Company would start to take shape. In the winter of 2013-2014 from the outside little progress seemed to be made, obstacles continued to hinder any progress until a change in legislation allowed micro brewers to self distribute up to 1000 barrels per year sparking a fire for Downey Brewing Company by cutting out the middle man and refining the business plan. The building already being zoned correctly for production, ideas for a taproom were shelved and the race to distribute started. With location covered, and great beer recipes in hand, the next hurdle was raising capital. Moving into the summer of 2014 as a post-college, pre-career move John took a job at one of SE Michigan’s finest home brew stores, Adventures in Homebrewing and furthered his studies in the art of brewing craft beer. It was within this season after months of weekly meetings that a vision and directive for Downey Brewing Company would be reached. The plan to achieve all location and capital requirements would join in a major launch event to showcase a robust product line, conduct some market research, and promote a very impressive Kickstarter campaign. This event would get the building ready for a brewing and raise enough money to purchase the necessary equipment to start the brewery. The Kickstarter campaign made a huge splash within the friends and family circle and didn’t stop there raising a dramatic $25,000 in 30 days with a thrilling last minute $3,000 dollar anonymous donation to break though the all or nothing threshold. With the Kickstarter funds and some additional capital from the founders Downey Brewing Company had fulfilled it’s initial capital requirements to purchase phase one of their equipment needs. Downey Brewing Company jumped through the final few hoops pre-launch phase. got their brewers license and regulator affairs in order. Then started brewing up an absolute raging of a Grand Opening on November 5th, 2016. Since then there has been so much demand for Downey Beer the have not been able to make it fast enough. There have been several equipment upgrades and outside sales continue to be on the up and up. Downey Brewing Company can be found in about 40 bars arround metro Detroit. The core of Downey Brewing Company doesn’t lie in its great beer or fortunate location but rather its founders, each individual bringing a complementary set of business skills to the table and each capable of brewing a tasty barrel of beer. Dean offers decades of operational business and management experience. Daniel has specialized in marketing with successes already in the Kickstarter video and company website, FB, IG, YouTube Channel, VLOG, BLOG, Podcast++. John by trade is a CPA so by the books DBC will always be in good hands and in a very beneficial situation having lots of professional services done in house. As the saying goes, two heads are better than one. So, image what you can do with three. Stop by the taproom (13121 Prospect, Dearborn) or look for a tap handle in your favorite water hole for a taste of this legendary brew!